Foursquare Mobile offers up many of the standard Foursquare features, including mayorship (in which you are declared “mayor” of a location by arriving at a location more times than any other in a sixty day period), and badges (which are more like achievement points, but for visiting places and doing other things, many of which are largely unknown until you actually achieve them). One particular badge was discovered, reportedly, when an astronaut checked in from the International Space Station, so completionists can pretty much forget it. Also, users can become Superusers, by which they’re permitted to make changes to the database depending on their rank. 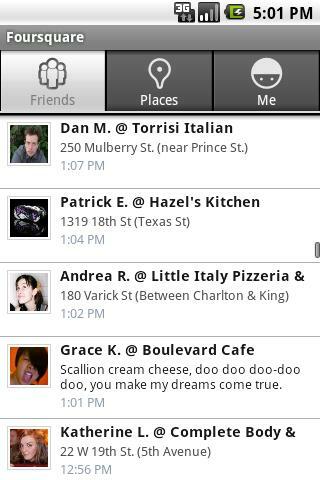 Basically, Foursquare is designed for people to relay where they’ve been to other people, be it their friends or random followers. That in turn is going to be great for small businesses that depend on foot traffic. Users get to not only spread the word on where they go and what they enjoy when they get there, but they also get a chance at badges and ranking, psychologically important and behavior reinforcing. Your bar, your club, your restaurant…all these can get boosts from Foursquare and its bizarre system of rewards and notifications. Of course, if you don’t depend on traffic, then Foursquare likely won’t be valuable for you, because you don’t particularly need to be concerned about how many times someone comes to your business. Still though, consider your position. And when you do, you may discover that Foursquare can offer plenty of value for your business.